They say that boy not only ate his family, they said he went mad with hunger. He went after my people, and then when my tribe caught him, they... Killing him would have been too easy. They wanted that boy to suffer. For his crimes against our people, crimes against nature. They cursed him. He's doomed to roam the woods always starving. And if he didn't feed his body would eat itself. The Kohonta aren't born. They're made. A Kohonta is a human who engaged in extensive cannibalism and was punished by the Native Americans for it. A shaman curses the person to transform into a creature with an insatiable hunger that is bound by magic to be trapped in certain areas of forest. The name Kohonta is translated from an unknown Native American language, meaning "whistler", something which Henry Parker had been doing during his transformation into the Kohonta. As the Kohonta, Parker would signal his presence with a distinctive whistle, which would be carried throughout the forest. Immortality - A Kohonta has the capability to live for centuries. Invulnerability - A Kohonta appears to be invulnerable to most forms of harm. Being shot twice in the back only caused one some pain and failed to slow it down or stop it. Super speed - A Kohonta can move at an incredible speed. Super strength - A Kohonta is very strong, easily able to throw grown men around. Silver - A Kohonta can only be killed by a silver blade through the heart. In Polk City, Iowa, a Kohonta kills a teenage girl, Barbra, witnessed by her boyfriend Thomas and Thomas's father, Sheriff Mason Romero. The attack draws the attention of Sam and Dean, who discover a pattern of missing people in the area going back to at least 1943 and possibly further. Investigation into the local lore reveals a Kohonta as the culprit, while Mason identifies the Kohonta as Henry Parker, an early settler in the area who engaged in cannibalism and was cursed for it. Though the Native Americans had bound Henry to part of the forest and marked it, the truth was forgotten over time and thought of simply as a legend. In a confrontation with Henry, Mason kills him with a silver blade to the heart and they are able to save Thomas, who had gone after the Kohonta in revenge. The creation lore for a Kohonta is similar to that of a wendigo. The primary difference is that the Kohonta is cursed before they reach the point where their cannibalism would transform them into a wendigo. "What a special episode for us! 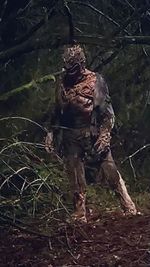 Shout out to the outstanding Andrew Long, who brought our creature to life, and let us complete building the suit on him over a series of 4+ days. Thank you to @geoffredknap for seeing our vision and then being there with us for every creature-suit build day and set day."